It seems we’ve stormed headfirst into Spring around here. It’s no longer freezing cold, but it’s been chilly, rainy and, well, stormy lately. I’m happy to see Winter hit the road, but I’m so ready for days filled with warm sunshine that I can taste it. No wait, that’s just the Lemon Pudding Cakes. 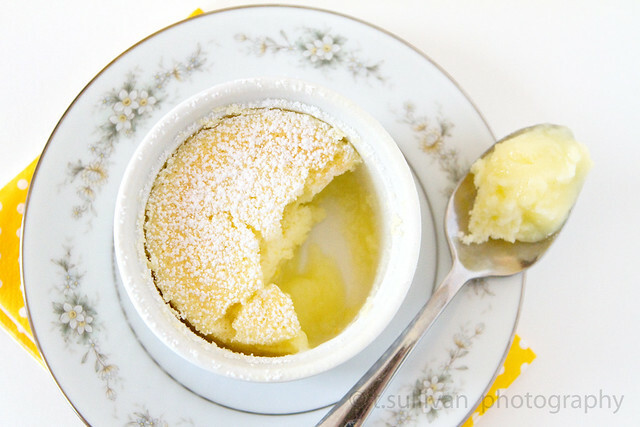 If you need some sunshine in your life, make these Lemon Pudding Cakes. They’re bright and sweet and light – a perfect pick-me-up after a long, cold winter or a dark and stormy Spring day. I managed to use 4 6-ounce ramekins and 3 7-ounces very full ramekins for this batch, so you’ll need at the very least 8 6-ounce ramekins for the full batch. I strongly recommend using fresh squeezed lemon juice as it’s the star flavor in this very lemon-y dessert. I tried these both warm and chilled – I preferred mine chilled. Preheat oven to 350°F. Spray eight 4- to 6-ounce ramekins with non-stick baking spray. Place ramekins in a roasting pan or baking dish deep enough to reach the top of the ramekins. In a medium bowl, whisk together 3/4 cup sugar, flour and salt. Add milk, lemon zest, lemon juice, melted butter and egg yolks. Whisk to combine. Using an electric mixer with a whisk attachment, beat egg whites on medium-high speed until soft peaks form. While beating, slowly add the remaining 1/4 cup sugar. Continue beating until egg whites form stiff peaks and look glossy. Carefully fold the egg whites into the batter. (It will be soupy). Divide batter among prepared ramekins in roasting pan. Put roasting pan in oven and fill pan with enough really hot tap water to come halfway up the side of the ramekins. Bake until set on top and lightly browned, 25-30 minutes. Cool ramekins on a wire rack. Serve warm or at room temperature, or cover each ramekin with plastic wrap and chill to serve cold. Dust with powdered sugar before serving. I love this! Bright and fresh and makes you feel like spring — even when it’s 30 degrees outside. Lovely! Another of your recipes I am sure to try. We all need some March sunshine! These look delicious and easy! I love lemon-y thing. I wonder how this would be with a little raspberry sauce alongside. These look wonderful! There is a similar recipe for these in the “Great Food Fast” cookbook and I have been wanting to make them for some time. Lemon is my absolute favorite fruit dessert flavor. I love your china, by the way–so delicate and pretty! You could not have posted this at a better time! After my sojourn into cake and donuts this past month I’m kinda over rich desserts (for now anyway). This sounds fresh and light and it’s only 5 weight watchers points. I love finding desserts I don’t have to feel guilty about! Oh my YUM!!! I adore lemon. Love lemon and always have extra fresh lemon juice on hand. I love the looks of this. You have my tastebuds tingling! Can’t wait to try this! This is simply lovely! Plus lemon is my favorite. Oh…my….sounds lovely! I do believe I have all the required ingredients!! YUMMO. Thanks for sharing! Yum Yum eat ’em up. That’s all I have to say. I just posted our passion fruit pudding but this is looking a little bit more enticing. It’s almost like lemon flan + cake–brilliant! Where’d you get the recipe? I a big bag of organic lemons I need to use up so I’ve been looking for lemony recipes– this one looks worth a try! I have a bag of organic lemons I need to use up so I’ve been looking for lemony recipes– this one looks worth a try! Sweet recipe and thanks for sharing it with us. It looks so tasty and scary at the same time lol. How many calories does this cake have ? I’m just curious as to if I were trying to turn over a new leaf by eating more healthy foods and not have to worry about gaining more weight. would this be a safe for me to eat without feeling guilty afterwards ? Positively gorgeous. 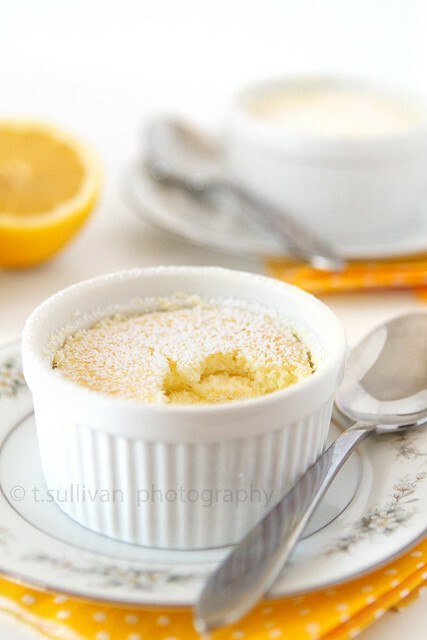 I’ve had a recipe for lemon pudding cakes bookmarked for a while and haven’t made them yet. Yours look so wonderful that it’s time to get some lemons! Oh my yummy! I made these last night and they were great. I found I prefer them warm – not that I had one of each or anything. Any ideas on how to do something similar, only chocolate? That was my husband’s request for me.